Address: Urbanizacion Montaña Roja, s/n, Playa Blanca (Lanzarote), Islas Canarias. 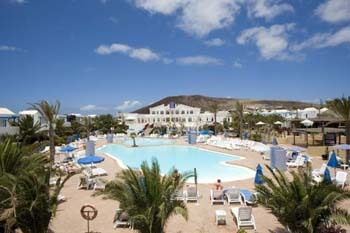 HI Paradise Island is less than 1 km from Playa Blanca Beach, on Lanzarote’s South Coast. The hotel features an outdoor pool, terrace and rooms with balconies. Each room has air conditioning, satellite TV and a seating area. Within the HL Paradise resort there is a water park, Dino Aquapark, which offers water slides for adults and children. The HI Paradise is set in attractive gardens and has a terrace with sun loungers. Other facilities include a poolside bar, lobby bar and disco. The HI Paradise Island is around a 20-minute drive from Timanfaya National Park and 34 km from Lanzarote Airport. Guests are required to show a photo identification and credit card upon check-in. Please note that all Special Requests are subject to availability and additional charges may apply. Please inform HL Paradise Island in advance of your expected arrival time. You can use the Special Requests box when booking, or contact the property directly with the contact details provided in your confirmation. Please note the property considers children guests up to 13 years old.